Our first port of call was at St. Peter Claver Basic School in Kingston. A basic school is what we would call an infant school, pre-primary, and the first step for children in formalised education. We chose St. Peter Claver as we were aware of the needs of the children attending school here and also because of a family connection to the church of which the school is attached. Back in May 2014 we made contact with Shirley Tucker, the school’s principal, and as you can see the school is in need of basic equipment such as chairs, tables and school supplies. Our hope is that as our relationship with the school continues we will be able to help with providing some of these basic resources. So we organised a day where the pupils and their parents could come in and grab some clothes and shoes with Shirley and St. Peter Claver School. The children and their parents trickled in on what we refer to as JMT, or Jamaican Mean Time and we were blown away by the vibe, by their smiles and just by their very simple happiness despite the environment, the very rough part of Kingston town where most of them live. We even managed to get down with some recorder, mouth organ and tambourine action to finish off what was a truly amazing day. All the shoes and clothing found new homes and for those that don’t see the kids’ shoes and clothing you donated in the pics it wasn’t until after the event that we managed to keep the pressure up at the wharf to clear the second half of our shipment. We dropped that stuff off to Shirley and she will be distributing it to the children from the school. As stated we will be continuing our relationship with the school and we may be asking for more of your help time goes on, so we’ll keep you informed. The Farm offers training, self-esteem and camaraderie in exchange for work on the farm to all who are ready to take the next step off the street and contribute back to sustain the services of Open Heart Mission. Two plots of land up in the mountains provide the mission fresh food to supplement food donations. Crops are tended, chickens and pigs are raised and lives are transformed out in the open air. We wanted the Open Heart mission to be the recipient of the adult shoes that we had as both Robert and Shirley, the main administrator at the Care Centre, told us that those that they help are in desperate need of shoes and that people coming to the Care Centre always ask whether the centre has had any shoes donated. A large percentage of their intake is men so in particular they needed men’s shoes. And so the shoes that were so kindly donated were just what was needed down in Montego Bay. We arrived just before their lunch serving and were given a tour of the facility by Shirley, and met both the amazing chef and security guard who keep everything in order at the centre. And then we met those being helped at the centre, mainly men, both young and old, who rely on the services provided by the Care Centre, on a daily basis. After lunch Kamal, the security guard brought folks into the office one by one to pick out a pair of shoes. It was somewhat ironic how so many of us queue up for the latest sneaker releases and here we had homeless individuals forming a line for some shoes that may have been queued up for before. But here there wasn’t that desire for exclusivity, instead there was a want to have what other, ‘regular’ people have, a decent pair of shoes. Also noticeable was how tight people would tie the laces of the shoes. Why? Because these individuals are homeless and tie their laces tight just in case whilst they are asleep on the streets someone should try and rob them for their ‘new’ shoes. That is the reality for these men and women. And it all could not have been possible without the kind donations of shoes and clothing so we would like to thank everyone that donated and helped make this trip possible. 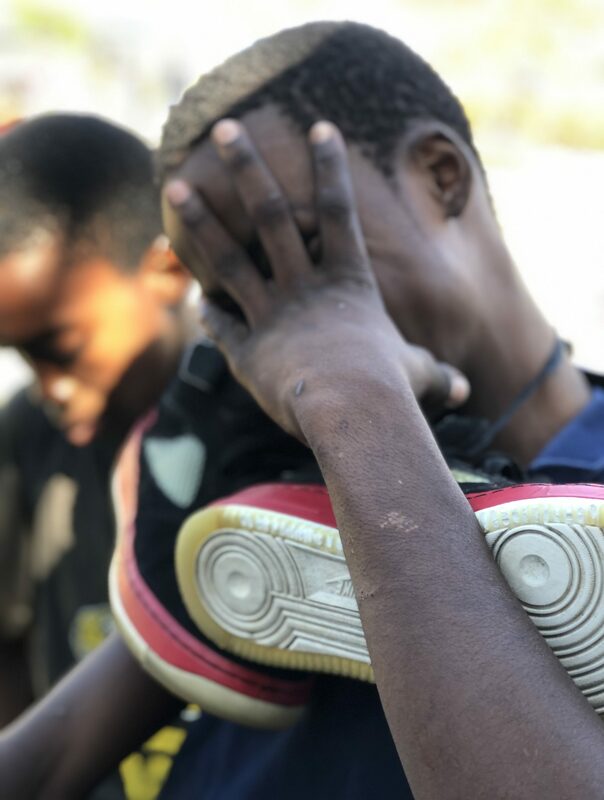 It is hard for many of us to imagine not having a pair of shoes on our feet or clothes on our back, but that is a reality for some in Jamaica. And the shoes that we distributed, made a change, no matter how small or big, in the lives of those that we met over the last couple of weeks. And that is HUGE. So BIG UP YOU GUYS and thank you so much for your support, our two shoe drives have helped so many people have a decent pair of shoes on their feet!